It’s a little-known fact, but once upon a time, Durango offered year-round skiing. However, knowing what we know now, even the most extreme adrenaline junkies probably wouldn’t be up to hit these particular slopes. The supposed year-round attraction was on a hill just south of town, covered with uranium tailings, which, oddly, has fallout dust similar in texture to snow, said local historian Duane Smith. Uranium has a long-embedded history in Durango. In the 1940s, a smelter at the current site of the Durango Dog Park was used to refine uranium for the Manhattan Project, which developed the atomic bomb during World War II. The smelter ceased for good in 1963, but the radioactive waste continued to be part of Durango’s landscape. Most concerning, Smith said, was the tailings were routinely used as fill dirt in building foundations. “There was a real concern what it might do,” Smith said. Many projects over the years have sought to clean up this unsavory past. But a class at Fort Lewis College this semester seeks to look further into whether the past is truly buried. Stacey Sotosky, an assistant professor who teaches Digital Video Production, said 16 students this year will take part in making a short documentary about Durango’s history with uranium and if any issues still linger. “I want them (the students) to walk away with the tools they need to get a job at a serious high-end level in broadcast television,” Sotosky said. The partnership between FLC and Rocky Mountain PBS is part of a broader effort to bring more localized coverage of the Four Corners to Colorado’s Front Range through the station’s regional innovation center program. The Colorado Office of Film, Television and Media awarded a $5,000 grant to help with this effort. Other Rocky Mountain PBS regional innovation centers are in Pueblo, Colorado Springs, Grand Junction and Denver. Their work is twofold: They teach students how to produce content and they generate local stories. Bliss Bruen has worked since 2010 to connect Southwest Colorado to the Front Range. She has been a key player, spearheading the partnership to bring an innovation center here. “If we have this, we can generate the stories that are unique to Southwest Colorado, which are really quite different than the Front Range,” Bruen said. Students will be assisted not only by Sotosky, but also Carol Fleisher, an award-winning documentary maker based in Durango whose work has appeared on PBS, NBC, Discovery and National Geographic, to name a few. Mari Carpenter, a junior at FLC, said she took Sotosky’s class because of an interest in film and a desire to learn different storytelling techniques. She is also interested to learn more about uranium’s role in Durango. “I’ve never really thought about it, but it’ll be good to bring it to light,” she said. FLC senior Michelle Olson, better known as “Flower,” said she fell in love with making videos after an introduction to media class. She hopes this project broadens her ability to tell stories. Last Thursday, the class dug through the archives at FLC’s Center for Southwest Studies, tasked with finding at least one bit of historical record that could be used for the film. The class will premiere its short documentary Oct. 17 at the Powerhouse Science Center. Fort Lewis College uranium documentary Fort Lewis College students taking a digital video production class are creating a short documentary about the history of uranium mining in Durango. The documentary will be shown Oct. 17 at the Powerhouse Science Center. Fort Lewis College students taking a digital video production class are creating a short documentary about the history of uranium mining in Durango. The documentary will be shown Oct. 17 at the Powerhouse Science Center. Award-winning filmmaker Carol Fleisher, right, works with Fort Lewis College students who are taking a Digital Video Production class. 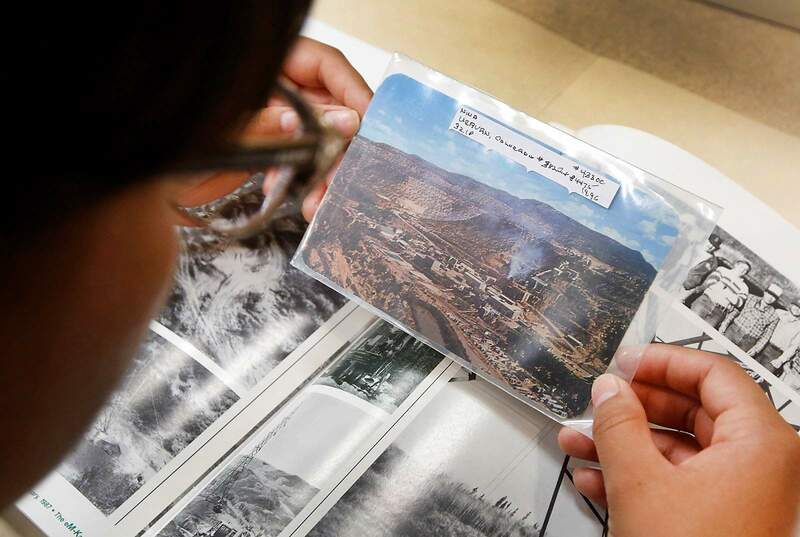 The students, led by Assistant Professor Stacey Sotosky, spent Thursday afternoon at the Center of Southwest Studies to look in the archives for documents and photos about the history of uranium mining in and around Durango. Sotosky and Fleisher are helping the students create a short documentary about uranium, which will be shown Oct. 17. The archives at the Center of Southwest Studies are a resource for Fort Lewis College students in Assistant Professor Stacey Sotosky’s Digital Video Production class. They will use documents and photos for a documentary they are making about Durango’s history with uranium mining. The class received a $5,000 grant from the Colorado Office of Film, Television and Media to create the documentary.